Aphids may cause significant yield loss in cereals as a result of either direct feeding damage or in-direct effects associated with viral disease spread. Yield losses of 10% have been shown from aphid feeding damage alone, in the absence of viral disease infection. Aphids feed on sugars in the phloem, with heavily infested plants often becoming covered in honeydew on which black sooty moulds may develop. The degree of damage caused by aphids is dependant upon both infestation level and duration. Barley Yellow Dwarf Virus (BYDV) and the related Cereal Yellow Dwarf Virus (CYDV) affect the vascular tissue and subsequently solute and water movement in the plant. Yield losses from disease infection can equal 50%, with grain quality also being affected. Symptoms of disease infection may not become evident until 3 weeks after infection and are often confused with nutrient deficiencies or other diseases such as red-leather leaf in oats. Yield losses are high where infection occurs prior to stem elongation (GS 31). 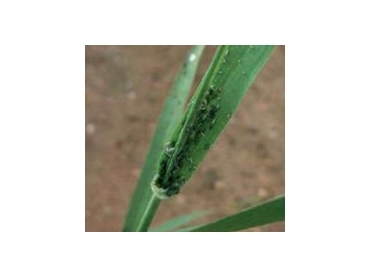 There are a number of factors that may affect the risk of BYDV infection and/or aphid infestation levels in cereal crops. Summer rainfall events that promote a green bridge enable an early build up in aphid numbers and thus increase the potential for yield loss where BYDV is present. This is particularly the case in areas where soil moisture exceeds approximately 40mm. The proportion of immigrating aphids that are infected with the virus is also important; with random surveys in Western Australia (1989-1992) showing 27-31% of surviving perennial grasses carried BYDV over summer. Forecasting models are available that estimate BYDV risk based on soil moisture in late summer and autumn, daily rainfall throughout the growing season, sowing date and crop cultivar. Karate with Zeon Technology, available from Syngenta , contains 250g/L lambdacyhalothrin, a synthetic pyrethroid insecticide that is registered for use as an anti-feed spray to prevent the spread of BYDV in wheat and barley. The active ingredient rapidly penetrates the cuticle of the target plant species. Once absorbed by the insect, nerve impulse transmission is disrupted leading to an immediate cessation of feeding, loss of muscular control, paralysis and death. The strategic application of Karate with Zeon Technology provides both knockdown and residual control and acts as a deterrent against aphids, the vectors responsible for the spread of viral diseases between plants. As yield loss from BYDV infection is high in the early stages of crop growth, it is important to protect the developing crop from aphids in a proactive rather than reactive manner. As such it is recommended that Karate with Zeon Technology is applied at 4 weeks after crop emergence (3-4 leaf stage) followed by a second application a further 4 weeks later. The first application may therefore coincide with an early grass or broadleaf herbicide application, while the second application may be applied along with a fungicide or post-emergent application of liquid-N.
Karate with Zeon Technology is registered for control of aphids and suppression of BYDV at low use rates of 12 or 18ml/ ha in wheat and barley. These low use rates reduce the logistical issues associated with storage of insecticide and disposal of excess packaging. Karate with Zeon Technology is an innovative water-based encapsulated suspension concentrate (SC) formulation. The active ingredient is contained within 2.5µm diameter polyurea capsules. Active ingredient release is rapid, unlike other encapsulated insecticides that consist of more rigid and larger diameter capsules. Karate with Zeon Technology capsules begin to release the active ingredient in less than 1 second after the spray has dried. The polymer capsules in Karate with Zeon Technology adhere strongly to plant surfaces and contain a powerful UV protectant to reduce the speed of insecticide degradation under harsh Australian conditions. The insecticide provides 3-4 weeks anti-feed activity, thus preventing aphid reinfestation and viral disease spread. Karate with Zeon Technology is extremely compatible with a range of crop protection products and is a good option for use with Flexi-N as the risk of leaf scorching may be reduced in comparison to emulsifiable concentrate (EC) insecticides including alpha-cypermethrin, dimethoate, omethoate and chlorpyrifos. The product therefore enables single pass insect control while still allowing the flexibility to tankmix or to apply a post-emergent nitrogen top-up. Zeon technology enhances adherence to the molecule to the target site. As a result Karate with Zeon Technology has rapid and robust rainfastness. Karate with Zeon Technology also provides control of Red-Legged Earth Mite when used in wheat and barley at use rates applied for BYDV control. Pasture Webworm, Pink or Brown Cutworm and Common Cutworm are also controlled at similar rates (always consult the product label before use). Karate with Zeon Technology is registered in a broad range of crops for the control of a number of common insect pests and thus is the insecticide of choice for a wide range of situations.